Submitted on August 5, 2011 - 5:41pm. I was disappointed to read the comments made to Science News by our new Acting Commerce Secretary Rebecca Blank about this report..."In fact, one might think that the smaller [salary] gap might actually draw women into STEM jobs." 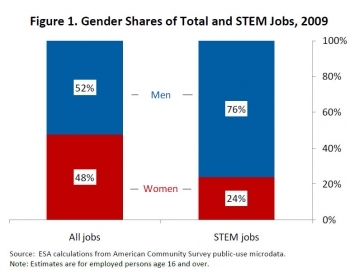 While, yes, the gender gap for women with a STEM degree is smaller than women in non-STEM jobs, it is still 14%! If you are a woman who just spent the past 11 years working hard to complete undergrad then grad school in a STEM field, it is discouraging to read about this 14% salary gender gap. I don't understand why Rebecca thinks that women should be more interested in STEM jobs because there is ONLY a 14% salary gap. That equates to a sizable sum of money in my book. Submitted on August 8, 2011 - 3:07pm. I find it amazing that our Department of Commerce is so interested women receiving pay similar to men in similar STEM occupations. The reason I find it amazing, I know thousands of men & women who would just be happy with being paid according to the laws that are on the books already! As a lower paid General Schedule Federal employee, I would be happy just to receive what the law states that I should be receiving! Despite filing reports, claims, and providing factual information to the Department of Commerce, the Census Bureau, the Office of Special Counsel, the Office of Personnel Management, not one individual within those mentioned agencies have yet to act on fixing the problem, and are causing those cheated employees to continue to lose out on countless thousands of dollars of yearly annual income that the law says they must receive. So much for fairness & equality! I've answered the simple math question below, could you have employees at the DOC do the math on how to properly promote employees that are promoted 2 grades at one time and share that information with the HRB's of all agencies affiliated? (The higher grade that exceeds the existing rate of pay is always the very next increment on the Salary Table used to promote, not the easiest line to use that offers the lowest wage of the employee promoted, resulting in a 10% loss of pay for most employees promoted 2 grades at one time who are actually in a One-Grade Interval Series! Both the Law and the Regulation are being violated daily and have been for decades. Submitted on August 11, 2011 - 12:08am. Submitted on August 11, 2011 - 11:58am.